The period of the year when ALICE plays the leading role at LHC has finally arrived: after smashing protons for months, the LHC accelerated lead ions on November 7th and continued until the winter shut-down. Following the 2016 restart of the LHC, we have asked the run coordinators of the four largest LHC experiments — ALICE, ATLAS, CMS and LHCb — to share a few words with us about the first data taking. Their broad physics programme will be complemented by the measurements of three smaller experiments (TOTEM, LHCf and MoEDAL) and may hold the key to new physics. 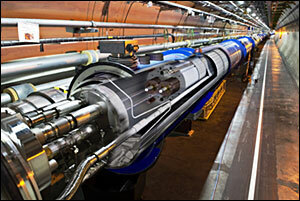 Two of the LHC experiments, ATLAS and ALICE, recently announced winners of the “ATLAS PhD Grant” and “ALICE Thesis Award” schemes. The prizes aim to foster healthy competition between young members of the two collaborators and acknowledge the hard efforts of the winners but also of those who were considered for these awards. The 2015 LHC proton run, the first after the long shutdown 1, ended last week with a good performance of the accelerator given the challenges of running at the new collision energy of 13 TeV. As the LHC prepares for higher energies and luminosities all four experiments have upgraded their triggering to record data more efficiently and make sure that their detectors are ready to find evidence for new physics. ALICE, presented a wealth of scientific results. Equipped with a central barrel with high-resolution tracking systems, several detectors for identifying particles from low to high momentum, electromagnetic calorimeters, and with a muon spectrometer at forward rapidity, the ALICE detector is ideally suited for studies involving hard probes.